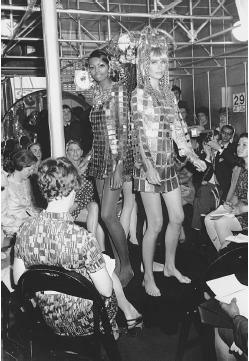 Paco Rabanne, fall 1968 collection: "The Water" (left) and "The Fire," (right) minidresses made of gold and silver plates. Paris, 1990; introduced leather goods, 1991; began condominium development in Miami beach, 1994; launched Champagne Lanson Noble Cuvee, 1998; parent company Puig closes Rabanne fashion, 1999; fragrances include Calandre, late 1960s, Paco Rabanne pour Homme, 1973, Metal, 1979, La Nuit, 1985, Sport, 1985, Tenere, 1988; Ultraviolet, 2000. Exhibitions: Body Covering, Museum of Contemporary Crafts, New York, 1968; Paco Rabanne, Musée de la mode, Marseille, 1995; Une vision plastique: rencontre de la plastique et de la Haute-Couture, Musée du Peigne et de la Plasturgie, Oyonnax, 1998. Folies de dentelles, Musée des Beaux-Arts et de la Dentelle, Alençon, 2000. Awards: Beauty Products Industry award, 1969; Fragrance Foundation Recognition award, 1974; L'Aiguille d'Or award, 1977; Dé d'Or award, 1990; Chevalier de la Légion d'Honneur, 1989; Officier de l'Ordre d'Isabelle la Catholique (Spain), 1989. Address: 6, boulevard de Parc, 92523 Neuilly, France. Website: www.paco.com . Collections Paco Rabanne: 200 modéles de haute couture, 1966-1994, [catalogue], with Herve Chayette and Laurence Calmels, Paris, 1994. Paco Rabanne: Musée de la mode, 9 juin-17 septembre 1995, [exhibiton catalogue], Marseille, 1995. La force des Celts: l'heritage druidique, with Philip Carr-Gomm,Paris, 1996. Paco Rabanne: A Feeling for Research, with Lydia Kamitsis, Paris,1996. La leçon indienne: les secrets d'un homme-médecine, conversations avec Wallace Black Elk, with Wallace Black Elk, Paris, 1996. The Dawn of the Golden Age: A Spiritual Design for Living, Barcelona & Shaftsbury, Dorset, 1997. Paco Rabanne: Une vision plastique—rencontre de la plasturgie et de la Haute-Couture, [exhibition catalogue], Oyonnax, France, 1998. Journey: From One Life to Another, Shaftsbury, Dorset, 1999. 1999: Fire from the Heavens, Paris, 1999. Folies et dentelles, [exhibition catalogue], Alençon, France, 2000. Bender, Marylin, The Beautiful People, New York, 1967. Clemmer, Jean, Canned Candies: The Exotic Women and Clothes of Paco Rabanne, Paris & London, 1969. Loebenthal, Joel, Radical Rags: Fashions of the Sixties, New York,1990. Stegemeyer, Anne, Who's Who in Fashion, Third Edition, New York,1996. Kamitsis, Lydia, Paco Rabanne, London, 1999. Sharp, Joy, "Fashion Foibles of 1967," in Costume, No. 2, 1968. Tretiak, Philippe, "Paco le visionnaire," in Elle (Paris), 24 October 1988. Dutt, Robin, "Metal Guru," in Clothes Show (London), December/January 1989-90. Bourdley, Laurence, "Paco Rabanne," in L'Officiel (Paris), February 1990. Silver, Vernon, "Label Living: You've Worn the Perfrume, Now Live in the Condo," in the New York Times, 20 February 1994. Louie, Elaine, "Here's a Rainy Day Project (but Watch for Lightning)," in the New York Times, 30 May 1996. Whitney, Craig R., "An Old Prediction Speeds France's Annual Exodus," in the New York Times, 6 July 1999. Young, Clara, "Paco Rabanne," [profile] online at Fashion Live, www.fashionlive.com , 5 August 2000. It comes as no surprise, on viewing the designs of Paco Rabanne, to hear that he prefers to be described as an engineer rather than a couturier. Son of the chief seamstress at Balenciaga (famed for his intricate techniques of construction), Rabanne, after studying architecture, made his name in the 1960s with a series of bizarre, futuristic garments made out of incongruous materials. When viewed on the catwalk they seemed space-age prototypes rather than high fashion garments. Believing that the only new frontier left in fashion was the discovery and utilization of new materials rather than the old couture method of changing lines from season to season, Rabanne totally broke with tradition, experimenting with plastic and aluminium, to create some of the most eccentric yet influential garments of the 1960s. It was estimated that by 1966 Rabanne was using 30,000 metres of Rhodoid plastic per month in such designs as bib necklaces made of phosphorescent plastic discs strung together with fine wire and whole dresses of the same material linked by metal chains. When he had exhausted the possibilities of plastic, Rabanne created a contemporary version of chainmail using tiny triangles of aluminium and leather held together with flexible wire rings to construct a series of simple shift mini dresses. The delight of his designs comes in the use of disparate materials not previously considered appropriate for use in clothing, or the displacing of traditional materials in order to produce strange juxtapositions of color and texture. He was, for instance, one of the first designers to combine knits, leather, and fur, using combinations like a cape made of matte silver leather triangles with black ponyskin or a coat teaming curly white lamb and white leather. It could be said that in the 1970s and 1980s the name Paco Rabanne became associated with male toiletries rather than for the intriguing experimentation he had been carrying out. Rabanne relies on the sales of his successful line of skinscents—including Calandre, Paco, and Metal —to finance his more technological projects. In 1971 he collaborated with Louis Giffard, an authority on flow-molding techniques, to produce a raincoat molded entirely in one piece of plastic.Even the buttons were part of the same process, molded directly into the garment and fitting into pressed-out pieces on the other side of the coat. In the 1990s, with a 1960s renaissance in full swing, the inventive caliber of Rabanne has been rediscovered. His latest collections are concentrating on stretch jersey, cotton, and viscose fabrics in metallic hues, still accessorized by enormous pieces of jewelry. The high modernism of his 1960s designs seems touchingly innocent when viewed through the jaded eyes of the 1990s. Science and technology in contemporary culture signify something far removed from the faith and hope in the future Rabanne was expressing with his self-consciously space age materials. His designs give less a sense of the future than imbue us with feelings of nostalgia for the optimism in new technology he embraced so fully in decades past. By the end of the 20th century, Rabanne had broken ground on condominiums in Miami's South Beach, introduced a prciey champagne, a new fragrance ( Ultraviolet ), and published several new Age books, including a bestselling doomsday-ish tome based on his interpretations of several Nostradamas prophecies regarding 1999. On the fashion scene, however, Rabanne designed his last collection in July 1999, preparing to leave his various labels in the hands a cadre of assistants. Yet Rabanne's backer, Spain's Puig Fashion & Beauty, pulled its support, effectively shutting down the label. While Rabanne's clothing may have become less controversial over the years, his often audacious beliefs and outspokenness will probably continue to shock and amuse for years to come.